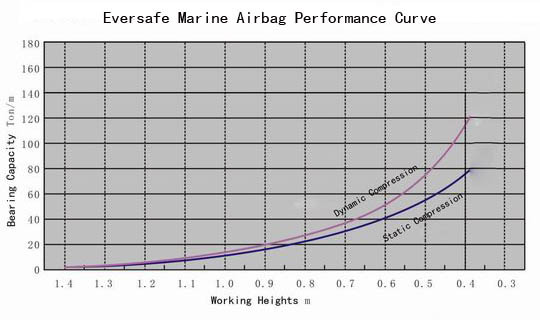 Marine airbag’s performance is different when it is slow or quick compressed. Slow compression is treated as isothermal compression and quick compression regarded as adiabatic compression. In the practical calculation, people take airbags'compression as dynamic compression when ship moves into water with airbags and in heavy lifting process regard it as static compression. Performance data of marine air bags with 4,5,7,8 plies are available on request.